Quite frankly, I can’t blame anybody that fears reserving a place that they have never seen online. What we have tried to do online is create an accurate image of our inn. With this in mind, we have created a list of the most common questions, and honest answers. There are tons of places to stay in Ogunquit – why should I stay at The Abalonia? There really are a lot of places to stay in Ogunquit. OK, there are tons. But remember when you are on vacation, you really want to the ability to walk everywhere. To wait for a trolley or to get a taxi just to wait in traffic when you want all you really want is to be at the beach is not fun. So, I would definitely say the best reason to stay at the Abalonia is LOCATION. We are located right in the center of the village, and only about a 3 minute walk to the beach. How far a walk is it to the beach? Clubs? Restaurants? We are located IN the center of the village. It will only take a couple of minutes to walk the restaurants and clubs in the village center. We are located about 100 yards north of the ‘funny intersection’ in the center of town. It will take you anywhere from 3 – 5 minutes to walk to the beach and about the same to the entrance to Marginal Way. Perkins Cove is at the end of the Marginal Way. Notice how I say “walk” to everything? In the summer, you do not want to have to get into your car. The traffic here is awful in the summer! What is there to do in Ogunquit and the area? Simple: a lot and not a lot. It really depends on you. Ogunquit is a quaint village with a lot of community-based activities. The world-renowned Ogunquit Playhouse is right down the street as are the Booth Theatre and Ogunquit Performing Arts. Ogunquit boasts a beautiful beach, a peaceful Marginal Way ocean walk, and the working fishing village of Perkins Cove. While Ogunquit is known for its natural beauty, the local shopping and restaurants are Ogunquit’s second wonder. 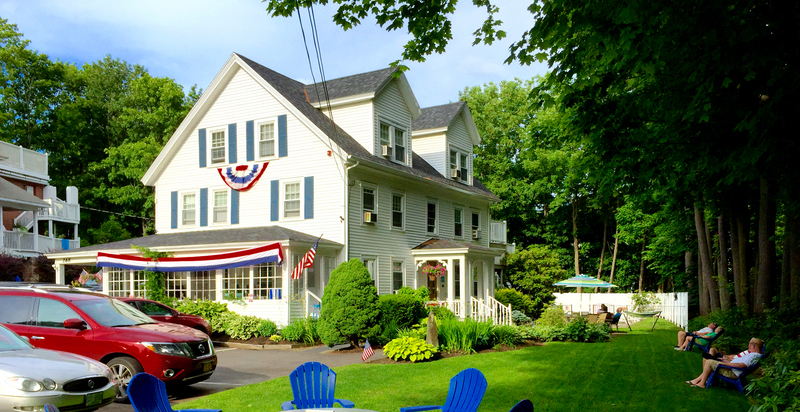 For those of you seeking a more lively vacation, there are 3 clubs within walking distance of the inn. Still not enough? Maine’s largest city, Portland, is only 35 miles North of Ogunquit and boasts an active “Old Port” and lots of sight-seeing. Portsmouth, NH is only a few miles south of Ogunquit and has a great historic district. Even closer are the factory outlet malls of Kittery, Maine. York Beach has lots to do, and it is only 4 miles to our South. For you outdoor enthusiasts – There are 4 golf courses in the area (Cape Neddick Country Club, Ledges Golf Club, Outlook, and Sanford Country Club), and there are places to rent Kayaks for both fresh water and salt water kayaking. Hiking or biking up Mount Agamenticus, only 7 miles from the inn, is a must. We do offer discounts for stays 5 nights or longer. While we do not offer a full breakfast, we do offer complimentary coffee, tea, juice, and muffins in the morning to all of our guests. We also offer discounts at local (and yummy!) full service restaurants. No, we are closed for the winter months. Can I get more information about having a wedding or party at the inn? We can email you a specially prepared wedding/special event package. Off season, you are usually safe to make a reservation only a week or two or even a day or two in advance. But, we start filling up for summer in the spring. We are at 100% occupancy in the summer, so try to make your reservations as early as possible if you are reserving for the summer. There are always last minute cancellations, so even if you are a procrastinator, give us a call. If we don’t have availability, most likely we will know a place that will. If I were to MapQuest/Google your location, what is the exact street address? Parking is available right on the property and it is free. We permit one vehicle per room rented. We can also help you find additional paid parking. Parking may NOT be included when you book through OTA (online travel agents). Please check with your OTA. Can you tell me whether you are pet friendly? No, I am sorry, but at this time we cannot accept pets. You are right, we used to be pet friendly. But, what we found is that pets are not allowed on Marginal Way and the beaches and pretty much have to stay in the rooms while you enjoy the sites of Ogunquit. We love pets, but just don’t think it is fair for them or the other guests that may not share our love for pets. Are there any other charges like local taxes, resort fees, or the like? No. Your room rate is simply the rate plus 9% Maine Sales Tax. We absolutely understand circumstances come up where you need to cancel a reservation. While other places charge one nights’ stay for a cancellation, we will only charge you for the nights’ stay if we are not able to rebook the room. We are not interested in getting paid twice for the same room. One word of advice: if you need to cancel, cancel as early as possible! Cancellation Policy: Cancellations made 2 weeks prior to arrival are guaranteed a refund less a $35 cancellation fee per room. If less than 2 weeks’ notice is given, the entire reservation, less cancellation fee, will be refunded only if the room is re-rented. Cancellations must be confirmed by Abalonia. “No Shows” will be charged for the entire reserved stay. There are no refunds for early departure. This is for direct book reservations. Bookings made through OTA’s will be charged non refundable full balance 14 days before arrival. Is the Abalonia kid friendly? We totally love kids, but please understand the Abalonia Inn has a quiet and relaxed atmosphere and may not appropriate for small children. All of our guest rooms have one bed. How many guests can my room accommodate? The rooms can accommodate two people. Do you have a Pool and Firepit? Yes! We have a beautiful heated salt water pool and firepit! Can I request a certain room or floor when making my reservation? We can guarantee you the King or Queen room that you reserved. If you book direct, we will do our best to honor all other requests. Not all rooms are available through OTA’s.